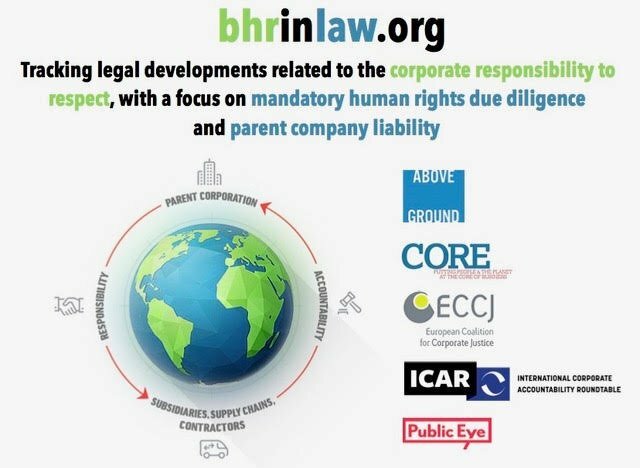 Today, in partnership with the International Corporate Accountability Roundtable, the European Coalition for Corporate Justice, the CORE Coalition and Public Eye, Above Ground introduces www.BHRinLaw.org. This site provides up-to-date news and summaries of developments in the push to make business respect for human rights a legally enforceable requirement, through legislation and case law. Globalized business operations present complex challenges for the protection of human rights. States around the world are developing innovative legal approaches to ensure corporate respect for human rights across borders. BHRinLaw.org highlights these key international developments, unpacks them, and makes them accessible to decision-makers and the public. The site provides information on state-driven initiatives to codify the corporate responsibility to respect human rights and enhance access to remedy, highlighting developments in mandatory human rights due diligence and parent company accountability from around the world. It also acts as an online hub for news, events, research, documents and media on this topic. While it is geared towards anyone with an interest in business and human rights, we hope that it will prove especially useful to policymakers, who can use it to access up-to-date information about developments in this rapidly evolving field, thereby facilitating assessments of their countries’ relative performance and providing input for policy development. There is an urgent need for bolder action from governments to protect human rights and provide access to remedy for victims of corporate human rights abuse. With this website, we hope to assist states to embed the corporate responsibility to respect human rights globally into law. To find out more about www.BHRinLaw.org or submit a piece to the blog, please contact Heather Cohen at heather@icar.ngo.